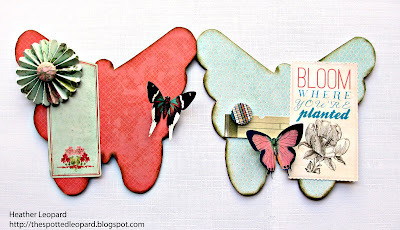 sei lifestyle: Butterfly Mini Book + GIVEAWAY! Butterfly Mini Book + GIVEAWAY! Hi, Heather here again! I can’t believe this week went by so fast. I have had such a great time playing in my scrap room with the new SEI collections. I hope they have inspired you along the way! For my final project, I remembered I had bought a butterfly chipboard album at Michaels for $1 several years ago so I went into my stash of alterable items hoping I didn't give it away when I cleaned out my scrap room. Of course, it was there because I keep everything. I love the 6 x 6 paper pads for cards but you know what? They fit the mini butterfly shapes perfectly so I put the papers I wanted to use in order, traced the butterfly shapes on the back, cut them out and adhered them to each page. Once I had them all glued down, I used my Imaginisce d-stress tool to sand all the edges. I chose the newsprint album for the cover because I wanted something neutral. I knew I wanted to capture all of the Field Notes colors on the cover and anything else might have been too busy. I inked the edges of each page with cocoa ink. Then I layered the yellow punched strip die-cuts from the Sample Box, stickers, a butterfly, which I fussy cut from the Butterfly Collection paper and a rolled flower from the Arboretum paper. The sticker in the upper left corner was intentionally left blank to that I can personalize it when I am ready to give them to someone special. When I started on these two pages I knew I wanted to add the frame that I had fussy cut from the Vignettes paper, however; when I laid the frame on the stripes it looked horrible so I added the coordinating green from page 2 as a background and then it all came together. 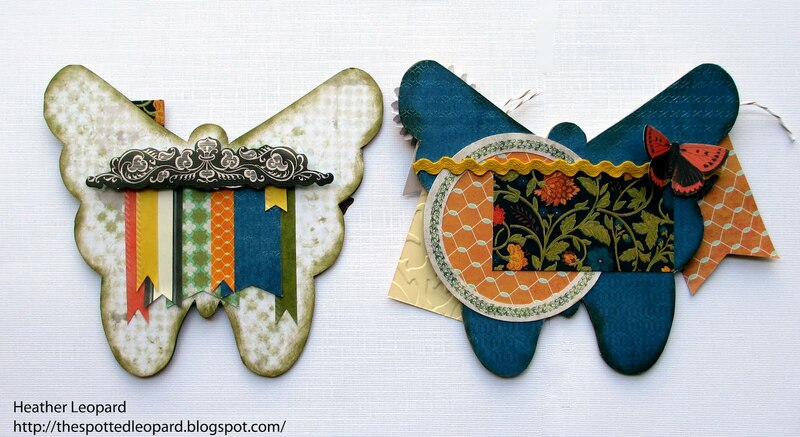 Again, more die-cuts and fussy cut butterflies. I kept page 2 more simple by adding some twine and die-cut butterflies. I love the pop of the orange flowers in the Arboretum paper so I played that up a bit by adding the orange behind the circle die-cut image and then layering the floral paper over it to make a photo frame. More banners but this time it's an assortment of banners, tags, frames, flowers and buttons. I was going for the eclectic look. 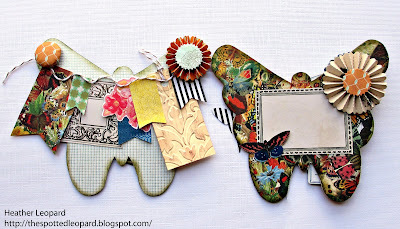 Mostly, I wanted something as fun as the butterfly paper on the coordinating page. I love this butterfly paper but it can be a bit much for me is I use a lot of it at once. So, I covered the page and toned it down by adding a basic frame and a neutral rosette. Of course, it needed another butterfly to pull it all together. I love the more muted tones of these papers that are in the collection. 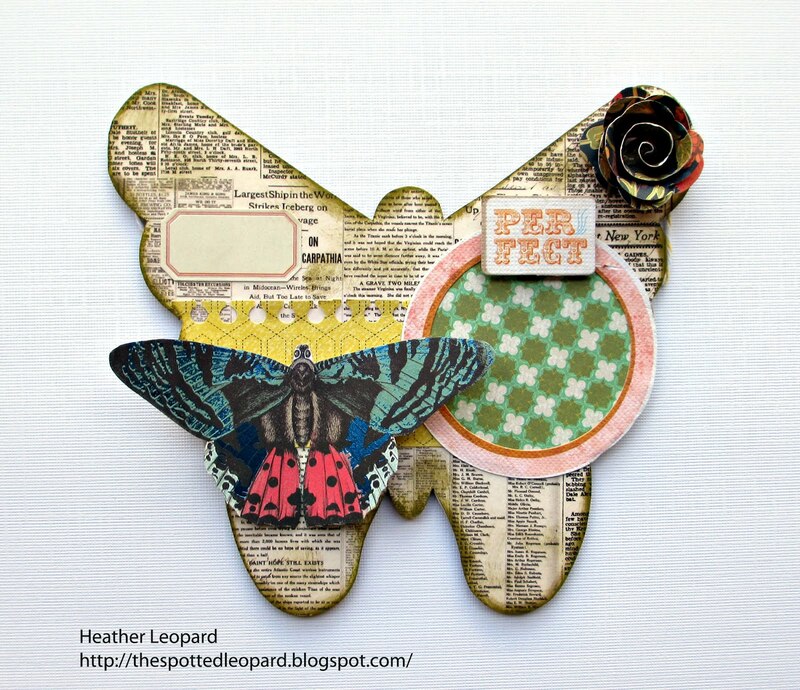 I simply layered the rosette and brad over the thin die-cut strip, offset the butterfly and left more clean space on this page. Similar to the coordinating page, I kept this last page clean and simple. 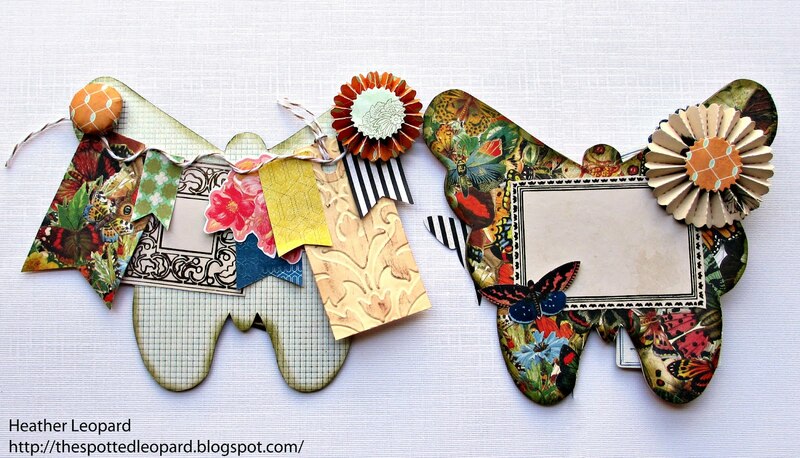 You can add a little photo or journaling to complete the album. I didn't get a shot of the back but I covered it in this beautiful goldenrod paper in the 6 x 6 paper pad. Thanks for sharing your week with me. I hope you enjoyed my creations. Thank you for sharing so many great Field Notes projects this week, Heather! It was fun getting to know you and seeing all of your pinterest inspiration too! Remember everyone, our week-long giveaway is still going. We will keep it open until Sunday, February 29th at midnight MST. To enter to win some Field Notes products, leave up to one comment on each blog post this week (Monday-Friday). That means you have up to 5 entries! this is just GORGEOUS Heather! I love that your facing pages coordinate and you've left space for some pics and journaling. 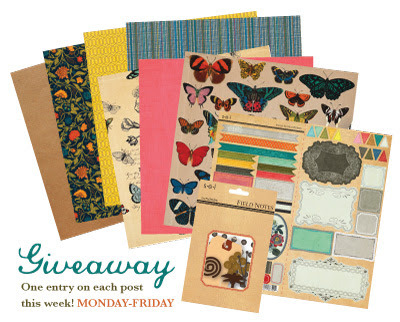 I love butterflies and love all the things you have done -- I so want this giveaway. I love what you've done. Very nice. Thank you for being here. What a beautiful album. Thanks for highlighting this great line this week. Wonderful projects! Love it! I could almost see it as a banner too! Perfect paper for a butterfly album - great pages - thanks for sharing ! Heather, you have outdone yourself. This album is very cute. I want one!!!! I Love butterflies, this stuff is amazing. Amazing talent! Thanks for the project idea. I need to dig around in my supplies. So often I just go buy something new, but I should just go shopping in my own stuff. Lots get hidden and can be "new" again once they resurface. I love butterflies! So of course I LOVE the Field Notes line. And I LOVE the butterfly book you made Heather. Inspirational! Really pretty. Love how colorful it is! I don't typically like butterflies but this is such a cute album! 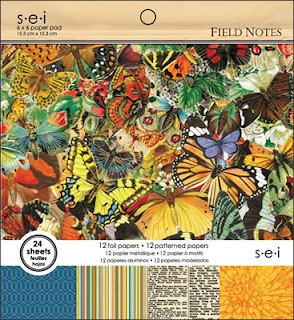 I opted out of the SEI march kit which included the butterflies paper but this is making me wish I didn't. Love the vintage feel of this book!! Well done! Wish I had just a tiny bit of your creativity. I LOVE the way you inked the edges of the papers. It gives it such a unique look. Beautiful album. You have used this collection so beautifully! Gorgeous mini butterfly book! I absolutely love it! Thanks for sharing. Very inspirational, can't wait to get crafting this weekends. No doubt I will have to need to incorporate a butterfly somewhere! Beautiful project. Thanks for the inspiration. Aw! So beautiful! Love it! Gardening is my second hobby and I love anything related to nature. I especially love brillant butterflies. You did an awesome job creating your album. I just love it. This collection would be perfect for making my 2012 gardening journal. Beautiful album. I am inspired. mini albums are my favorite, such a cute one! Just gorgeous Heather! I loveeeee all the butterflies! I love mini albums---really neat butterfly one! So pretty, love that album! LOVE what you did this week! I love this it is just so perfect for spring! 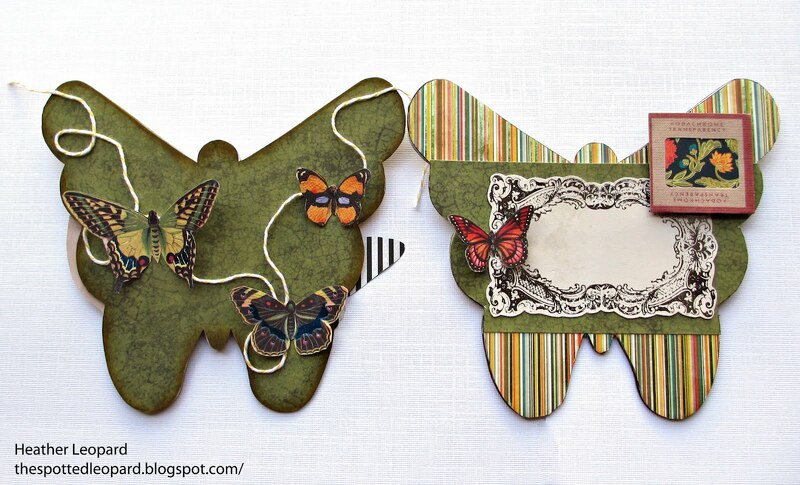 Very cute and versatile gift ideas using butterflies! This is beautiful! I wish the giveaway was your butterfly album! Wow, this is very cute Heather. You did an amazing job and the papers are great as well. So smitten with those butterflies, and what you've done with them! Beautiful mini! I have quite a few of the $1 chipboard books from Michael's. I just ADORE butterflies!! So pretty! Love this - I ordered 2 kits cause I love this paper so much & want to be able to share with some friends! I just found your butterfly collection and wanted to say how much I love it.